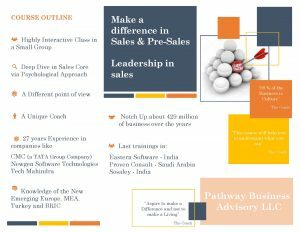 A Different and Unique Training in Sales in the Technology Industry which a company can provide for its employees. How to be successful in the international and cross-cultural environment? How the Leadership can bring the difference for a Sales team to stand out? You will be able to address your Sales Challenges and to receive a valuable Experience shared by the Coach. Not Sure? Join our Webinar to find out more about the Course.